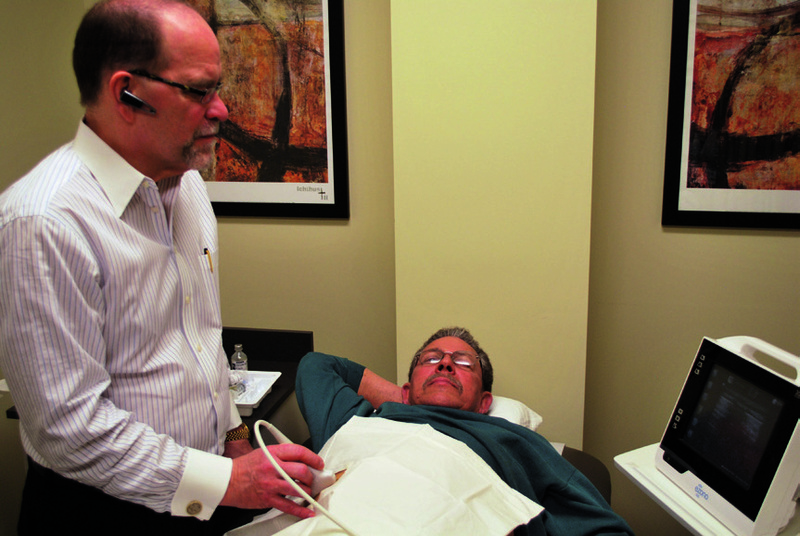 Ultrasound is not new technology, but its use in pain management has evolved recently as pain medicine specialists seek more precision and better diagnostic capabilities. “There is no other technology that allows me to do what ultrasound-guided imaging does,” affirms Witt. Ultrasound imaging has proven beneficial in multiple other applications such as trigger point injections where the individual muscles can be identified. This is particularly important for the injection of Botox or Myobloc, neurotoxins that break spasm. It is also very useful in the thoracic area as the pleura can be visualized and the risk of accidental pneumothorax reduced as a result. “Another advantage of ultrasound imaging is that I can use it as often as necessary on the same patient without radiation safety issues assuming the procedure can be done with ultrasound instead of fluoroscopy” says Witt. Dr. Witt founded the Cardinal Hill Pain Institute in 2009 after a 29-year career at the University of Kentucky College of Medicine and Medical Center, where he was Chairman of the Department of Anesthesiology and Director of the pain management program and fellowship. Both at the University and in his current practice, Dr. Witt does not use controlled substances in the treatment of chronic pain. Dr. Witt was trained in this approach in 1978, a time when opioids were rarely, if ever used in treating chronic pain. “There were only two pain programs in the Country at that time, Denver, where I was trained, and Seattle. We had excellent results with this approach then and we still do today,” says Witt. Combined with the outstanding therapy available at Cardinal Hill, including physical therapy, balance training, gait training, multiple other treatments and the only heated therapy pool in Kentucky, Witt is able to provide a truly comprehensive approach. “I want my patients to not just feel better, but to actually get better.” A program of abstinence from nicotine, weight loss, appropriate exercise, behavioral counseling and other modalities, combined with non-opioid medications, targeted injections and minimally-invasive surgical procedures accomplishes this goal with most patients. The Cardinal Hill Pain Institute sees a wide variety of patients with all types of chronic pain. The youngest patient is 17 and the oldest is 99. The majority of younger patients seek relief from pain caused by trauma such as automobile accidents or sports injuries. The more mature patients usually suffer chronic pain from degenerative conditions. Dr. Witt also has a “fast track FAX referral” system for referring physicians or other providers who do not need a comprehensive evaluation and treatment program but only need a specific diagnostic or therapeutic procedure. For these patients, the procedure can be done within just a few days and the referring practitioner will have a printed report by FAX or electronic submission the same day. Also, because of the way the practice is structured there is no facility fee associated with injective treatment in the Cardinal Hill Pain Institute.